Jungle Red Writers: Celebrating DEATH ON THE MENU with a Hemingway Contest! Celebrating DEATH ON THE MENU with a Hemingway Contest! 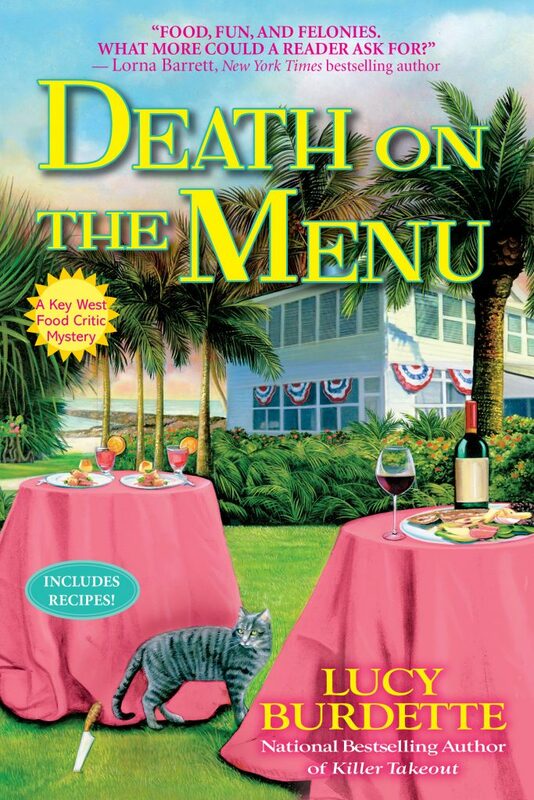 LUCY BURDETTE: Death on the Menu is in bookstores today! Finally! (And it's also the book birthday for Rhys's FOUR FUNERALS AND MAYBE A WEDDING--Hurray--she'll be telling you more about that tomorrow.) To celebrate, I declare this Hemingway copycat contest day. What does that mean? I'll tell you...but a little background first. Sometimes I go in directions I never imagine when I’m writing, and end up adding a subplot that I certainly didn't plan. For example, in DEATH ON THE MENU, food critic Hayley Snow is checking out a suspect and discovers that he is a Hemingway wannabe. And then while googling and studying up on Hemingway, I learned that there actually was a contest for "Really Bad Hemingway" in which contestants submitted a page of bad Hemingway-esque writing and prizes were awarded. So then of course I had to write a page that this character had supposedly written. So I thought it would be fun to have a contest right here, among all you clever Red readers. Put on your Hemingway fishing caps and post your best Hemingway-like paragraph in the comments. We have a great prize package for the winner including Lucy Burdette's DEATH ON THE MENU, a hardcover copy of Deborah Crombie‘s GARDEN OF LAMENTATIONS, a copy of Hank Ryan’s SAY NO MORE, Ingrid Thoft's LOYALTY, a paperback copy of Jenn McKinlay's DEATH IN THE STACKS, and a copy of Hallie's YOU'LL NEVER KNOW, DEAR. We will announce the contest winner later in the week. On your marks, pencils and keyboards ready, go! And ps, please come to Brookline Booksmith on Wednesday at 7 pm to hear about both new books and meet five Reds at once! Or come to RJ Julia at 7 pm on Thursday the 9th in Madison CT, where Rhys and I will chat and sign books and eat cake! Food critic Hayley Snow is thrilled to be working at a three-day international conference at the Harry S. Truman Little White House. But things get off to a bad start when Hemingway’s Nobel prize gold medal (which belongs to Cuba and is on display for this weekend only) disappears. And they only get worse when a body is discovered in the storeroom. Hayley must spring into action before the killer adds another victim to his menu. You can buy the book wherever books are sold. Happy book birthday, Lucy . . . Happy book birthday, Rhys. It’s definitely a day for celebrating! OMG you've hit a homer right out of the box Marla. Love this! Thanks, everyone! Glad you enjoyed it. As a cat owner, I would not presume to follow Marla's wonderful offering - it is purrfect! I'll simply say happy book birthday Lucy and Rhys! It is purrfect. Thanks a million Kait! Glad you both liked it! I always think of polydactyl cats when I hear Hemingway's name, so it seemed only right to craft an entry from kitty's point of view. Congrats on the book birthday for Lucy and Rhys! I was lucky enough to win a copy of Death on the Menu last week and I will look forward to reading it. My plan is still to make it to Brookline Booksmith tomorrow night where, as Kristopher from Bolo Books said on FB, it looks like it is turning into a gathering of the JRW authors/fans. Hope to see everyone there! Can't wait to see you Jay!! Wish I could be there to see the other Reds, and you, too, Jay! Of course, I'm still waiting for your next book tour when you come back east and I can attend what will hopefully be a return to the stop I've seen you twice at now. Going to my bookshelf and taking down a Hemingway right now... it's been awhile. Lucy, I'll be at Brookline Booksmith tomorrow night! looking forward to reading both new books. Congratulations to Lucy and Rhys. I had heard of the bad Hemingway contest before but I'm not even going to try. Instead I'll enjoy the efforts of others. Why not enjoy as a spectator Judi--we need those too. thanks! I don't think I've read Hemingway in forty years, and this certainly isn't my day for creativity. Congrats on your book birthdays Lucy Roberta and Rhys. I wish I had half your talent and all your skills at story telling. That made me laugh out loud, Ann! Thank you Ann. This should come with a warning label"Don't read while drinking coffee." OMG, I don't think I could top Marla's entry (at least not at 8:41 in the morning on only one cup of tea). Congrats to Lucy and Rhys. Someone is going to win a fabulous pack of books! Love it, thanks so much for trying the game! Congratulations Lucy. Happy Birthday Rhys. I look forward to the movable feast of responses. See! This is why we all get up in the morning and read this blog. You just never know if you will have a moment, an epiphany, or just spit your coffee out! Lucy, first, wow!!! What fabulous reviews for you and Hayley!! Looks like this one will be sailing off the shelves!! (And congrats to Rhys, too!). I need some summertime mojo--and it sounds like a Key West fix is just what I need! Oh Flora, just brilliant, thanks for playing! Aw shucks, thanks! Just don't ask me to try Faulkner. . .
No time this morning to badger my brain into thinking like Hemingway. Who will never be my favorite author, and whose alcohol-soaked prose always gives me a contact hangover. But happy book birthdays, dear Rhys and Lucy! And LOVE the Hemingway contest! Can people post entries in the comments all week? Happy release day to both of you! I'll give this faux Hemingway thing a think after a bit. And see you tomorrow night! I'm enjoying being part of the reading audience today. These entries have been extremely entertaining! It's probably time for me to reread Hemingway. Somewhere, maybe in a box in the basement, I have all his novels. Haven't looked at them since about a year after graduating from college. Oh DebRo, thank you so much--I'm thrilled that you found it in BN. And look, if you're hungry, let us know and we will send care packages! Hurray hurray hurray!!!!!! SO HAPPY for you!!!! Lucy, I look forward to the online book club chat with you on the Cozy Experience / Facebook page tonight! You saw my post yesterday on Instagram :-) and thank you for posting it in your stories. The Sun Rises novel by Ernest Hemingway is on the list of the 100 books for the great american reads. I was able to find your two previous Hayley books at the library. I am hoping that I will be able to find your Death on the Menu at the local chain bookstore. Looking for an Ernest Hemingway quote to share here. I was reminded of something I learned at the Book Passage Mystery Writing Workshop several years ago. I am going to quote from the first page of the book The Sun Also Rises. that as a boxing title, but it meant a lot to Cohn." thanks so much Diana aka wonderwomand, I was delighted to see and share your post. And look forward to the Facebook party tonight too. Y'all come! I'm afraid I'm not familiar enough with Hemingway to be able to enter the contest, but I did want to say happy book birthday. It was so wonderful to be back with the Key West gang. Happy Book Release Day to the both of you. I'll pass on the contest because this is a ripoff of A Clean Well-Lighted Place. But it was fun. Now, back to mowing my lawn. love it Angelo, thank you!! Rhys, you made me snort my coffee. Hysterical!!! Rhys, love this! Happy book birthday! I look forward to reading Four Funerals and Maybe A Wedding. Death on the Menu arrived in my in box this morning. All house hold chores have stopped. Really never liked Hemmingway.. and this will most likely show it. Ah, Maria and Flora, I like yours so much better than the original. I join the "heretic" . . . when students asked, "Is every author your favorite?" I answered, "No, dears, not Hemingway." Like Mark, I have not read enough Ernest Hemingway to try to imitate his style -- the last book of Hemingway's I read was THE OLD MAN AND THE SEA in high school, which I didn't think I would like, but I was amazed by how good it was and how I was drawn into the fisherman's story -- I could not put it down. Congratulations Roberta and Rhys on your book birthdays! Happy book birthday to Lucy and Rhys! And well done to those of you trying your hand at bad Hemingway! Happy Book Birthday, Lucy! Happy Book Birthday, Rhys! I think you know by my review, Lucy, how much I loved Death on the Menu. I'm going to run my blog post reviewing it on FB again today. And, Rhys, I'm hoping my copy of Four Funerals and Maybe a Wedding arrives tomorrow. I thought I'd pre-ordered it and apparently hadn't, so I did yesterday. How I wish I could be at the party tomorrow at Brookline Booksmith. I look forward to some great pictures from the event. Reds rule! we will miss you Kathy, thanks! Happy Release Day! I wish you both continued success with your wonderful series! Hooray Lucy/Roberta and Rhys! I hope to pick up both of your books later this week. As for Hemingway, we'll see if I feel like sassing him later. The last time I tried to read one of his books I had to stop. Felt like I was reading a parody. Happy book birthday, Lucy/Roberta and Rhys! I hate Hemingway. Short. Brutal. Misogynistic. Depressing. I understand that he was a man of his time, and spoke elegantly and eloquently to the war-shattered audiences of his age, but he's way, way, WAY down my list of authors I would ever read for fun. And why read if you don't enjoy it? I remember reading The Old Man and the Sea and The Snows of Kilimanjaro in school. I didn't like them and that was way too many years ago to parody. Happy book birthdays. Congrats on your new releases, Rhys and Lucy. Looking forward to reading both books. I am reading For Whom the Bell Tolls after listening to the audiobook of Love and Ruin. Enjoying it and finding it plenty complex. Congratulations Lucy! I am just missing being able to go to either book launch. Driving to New Haven tomorrow and then back to Falmouth Friday. Grammie duty!! Best wishes. Happy Book Birthday. I would love to read it.